The chapter on accuracy covers how to ride all of the main shapes with greater balance and accuracy. Stop throwing away marks due to inaccurate shapes which make the job of your horse more difficult that it needs to be. Improve the appearance of the suppleness of your horse. Learn how to prepare your horse for each movement correctly and produce a beautiful looking test. Understand the purpose of the movements in a dressage test, learn what the judge wants to see and what each movement is meant to demonstrate to the judge. 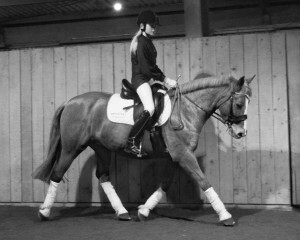 Avoid typical rider traps, and bust some of the typical dressage myths. Your horse will thank you for it. Have you ever entered the arena to school your horse and not know what to do? Have you ever hit a major problem training your horse something? This section not only tells you what you should be practicing, but how to go about it, and what you should do when you get into trouble. Learn to review your progress using different tools to use, how to understand judges comments and how to change your practice to improve. Simply turn to page 189 of your book and get the special code to access the online webinars, videos and articles. Suitable for riders up to Elementary Level (British Dressage) / Second Level ( USA Dressage), though even some of the higher levels will be able to glean useful information from this book. Is this book for you? Check out the ‘Who will benefit from this book?’ on the right hand side.